Trying to decide which medals to hang up on my medal hanger was difficult! I was amazed at the number of medals that I had accumulated since I started running. After every race, I chuck them into a shoe box and kinda forget about it. But sorting through the medals made me realize a few things. My medals from some of my favourite races! We get so caught up in the goals, so focused on what’s next and the training that we forget the journey we’ve been on. Every runner started as a beginner. For majority of us, 5km was a huge milestone. Now, we push on to get PB’s for half marathons, 42kms and even ultra’s. I hung up my favourite medals with a huge sense of pride and became quite nostalgic about certain favourite (and not so favourite) races. I remember the races where I rejoiced and felt good and those which made me cry and hate running. I recall my first 10km race where I managed to come in under 80 minutes and the Johnson Crane half marathon where I hit my first (and hopefully last) wall. The races I’ve hated and then fallen in love with again, such as the dreadful (but now my favourite) Deloitte, and Two Oceans – my schizo’ mix of fun runs and serious 21.1kms. When the selected medals were all hung up, I felt really good, incredibly proud of myself. We don’t get many opportunities in life to feel that way lately. My friend Pamela custom makes these medal hangers with whatever quote or title you want. I wish she could make me one with the title “Bron’s life” and I could see everything displayed up on the wall. All my goals accomplished, the lessons in life that I’ve learnt, the different experiences which have made me grow and become the person I am today. Oh wait… actually, nothing does that better than running and I’ve got the medals to prove it. Sometimes in life, you need to see it to believe it! 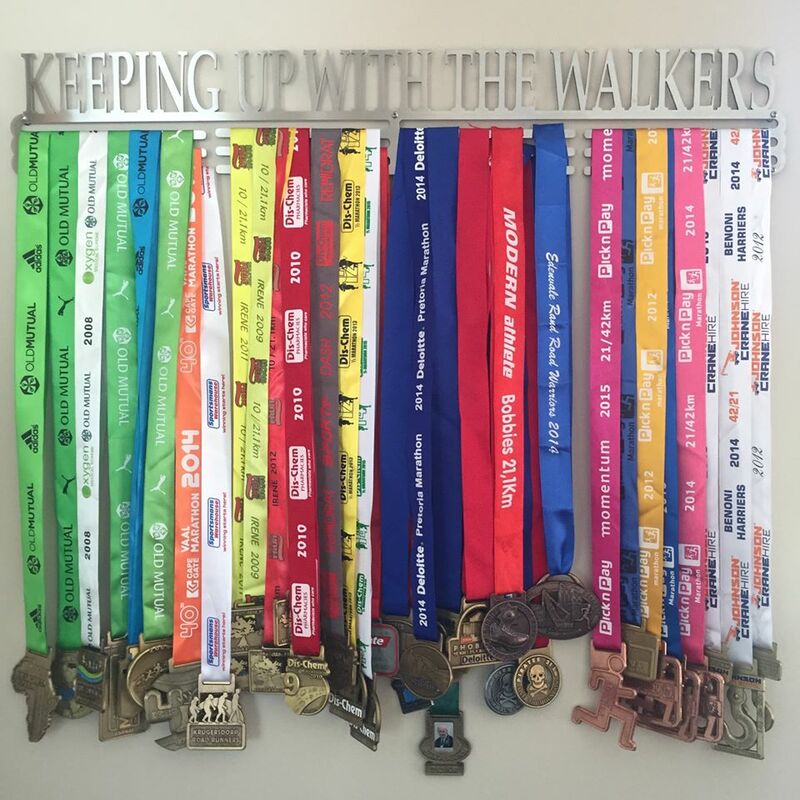 This entry was posted in My Celebrations, My Memories, My Races and tagged celebrations, medal hanger, medals, race medals, running medals, sa medal hanger by Bo. Bookmark the permalink.